Thimphu is the Capital City of Bhutan. The festival usually takes place during fall season. It is one of the most attended and witnessed festivals in Bhutan, by the locals and the Tourists alike, mainly because it takes place in the Capital City and secondly people from around, Paro, Haa and Punakha and Wangdue come to witness this festival. 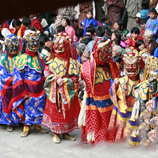 Part I : Thimphu Dromche: This one day of festival showcases the sacred mask dances dedicated to appease the protecting deity of Bhutan, known as Pelden Lhamo. Kuenga Gyaltshen , the first reincarnation of Jampel Dorji, son of Shabdrung Ngawang Namgyal, instituted the dance ceremony between 1705 and 1709. Legend has it,that Pelden Lhamo appeared before him and performed the dances while he was in meditation. 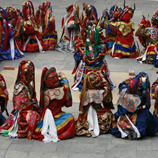 Based on these dances, Kuenga Gyaltshen initiated the dance ceremony. The first Thimphu Dromche took place in the year 1710. Thus the 2010 Dromche marked the 300th year of celebrating these sacred dances. Part II : Thimphu Tsechu: This three day festival includes festival dances SHACHAM(Dance of the four stags), PELAGE GINGSUM(Dance of the three kings of Ging), PACHAM(Dance of the Heroes), SHAWO SHACHI(Dance of the Stag and the Hound), DRANYEO CHAM(Dance with Guitar), ZHANA CHAM(The black hat dance), and the PHOLEG MOLEG(Dance of the Noblemen and the Ladies). Day 1: Arrival Paro and Drive to Thimphu, Over night in Thimphu. Day 2 and 3 THIMPHU : Witness the Thimphu Festival and do other sight seeing in Thimphu as and when time permits. Day 5 : Thimphu and then to Paro. Day 7: Early breakfast at the hotel and drive to the Paro Airport for departure.